The Verreaux's Eagle-owl is also known as the Giant Eagle-owl or the Milky Eagle-owl and is named after Jules Verreaux - a botanist and ornithologist from France. The Verreaux's Eagle-owl is the only owl in the world with pink eyelids, which appear as soon as one week after the owl hatches. The Verreaux's Eagle-owl can have a territory as large as 7,000 hectares! Young Verraux's Eagle-owls might accidentally fall to the ground when being mobbed by other birds, such as crows, who are trying to defend their own young from attack. Scientists have documented young Verraux's Eagle-owls closing their eyes and pretending to be dead if they are approached by a potential threat while on the ground. They will remain immobile until they have been left alone for quite some time. The Peregrine Fund is not working directly with Verreaux's Eagle-owls in the field, but a Verreaux's Eagle-Owl is on our avian ambassador team at our World Center for Birds of Prey in Boise, Idaho. As an avian ambassador, he helps educate children and adults about the importance of birds of prey in general and owls in particular. Additionally, our conservation efforts through habitat protection, education, and community outreach extend to all raptor species, including this owl. We also supply literature to researchers from our avian research library, which helps scientists around the world gather and share important information on raptor conservation. Found throughout Sub-saharan Africa, the Verreaux's Eagle-owl is widespread and lives in a long list of countries including Angola, Botswana, Cameroon, Central African Republic, Chad, Congo, Eritrea, Ethiopia, Gambia, Ghana, Kenya, Liberia, Malawi, Mali, Mozambique, Namibia, Nigeria, Rwanda, Senegal, Sierra Leone, Somalia, South Africa, Sudan, Tanzania, Togo, Uganda, Zambia and Zimbabwe to name just a few! Though it has an extensive distribution, the Verreaux's Eagle-owl avoids dense rainforest and instead prefers to make its home in dry savanna dotted with trees and thorny shrubs. It might also be seen roosting in the trees of a riverine habitats, searching for prey in woodlands, or flying over semi-desert areas (which is basically habitat that shares many characteristics with a desert, but generally gets more precipitation) and even in open countryside. It can be found from sea-level all the way up to 3000m. 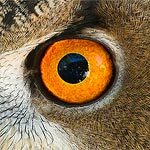 Imagine a large owl - the largest in Africa - with bright pink eyelids, a creamy white facial disk edged with black feathers, dark brown eyes, and a pale cream-colored bill with a bluish cere. Can you picture it? Though it might be hard to imagine a bird that looks like it's wearing eye shadow, this is exactly what the Verreaux's Eagle-owl looks like. But there is more! Like the Great-horned Owl, the Verreaux's Eagle-owl also has ear-tufts, which aren't really ears at all. They are feathers that stick up on the side of its head, that resemble mammal ears. Overall, Verreaux's Eagle-owls are mostly light grayish-brown with white and grey vermiculation - which is a fancy word for squiggly lines! It has a white throat which becomes more visible when the owl is vocalizing. Its legs are completely covered in feathers, and its toes are partially feathered. As you have probably already guessed, the Verreaux's Eagle-owl is nocturnal - meaning it is mostly active at night. While it spends its days roosting (or resting) high up in trees, on large branches that are shaded, it has been known to hunt during the day, if the opportunity to do so presents itself. Scientists have documented several Verreaux's Eagle-owls roosting together. These are usually family members, such as the breeding pair and their offspring. When they are roosting they might also preen or groom the feathers of the owl perched next to them. This is known as allopreening. During extremely hot days, this species may quiver or flutter its throat. Scientists believe this helps cool them off. The Verreaux's Eagle-owl isn't always content to just flutter its throat to cool down. This species is also known to enjoy a good bath in a rain shower, or in a shallow puddle to help escape the heat. While the Verraux's Eagle-owl is, perhaps, one of the most visually stunning birds, its call leaves a lot to be desired. It mostly makes a series of deep grunting noises that sound almost like a pig snorting. Thankfully, this isn't the only vocalization this species has. It can whistle - usually done by females and young owls when begging for food. It can hoot - most often done during courtship. And, it makes a loud, sharp alarm call when it feels threatened or disturbed. Like many raptors, these owls are top predators – they hunt other animals for food but no animals hunt them on a regular basis. For most top predators, their only threat is humans. Top predators, such as the Verreaux's Eagle-owl, play an important role in nature by helping to control populations of prey animals and maintain a balance in the ecosystems where they live. Thankfully, the Verreaux's Eagle-owl is doing quite well, both in its overall distribution and population numbers. However, like so many other raptor species - in some areas of its range it is becoming more and more threatened. Despite its large size, the Verreaux's Eagle-owl still faces some major threats. Like many other large raptors, one of its biggest threats is human persecution - or getting killed by people. Because it relies on large trees for roosting and nesting, loss of habitat is also a problem that could have detrimental affects on this species not too far into the future. Verreaux's Eagle-owl individuals have also died from crashing into powerlines and from consuming prey poisoned with pesticides. The good news is the Verreaux's Eagle-owl has shown its ability to adapt to human-altered habitats. So, as long as people don't harm them or their prey, they might be able to maintain a healthy population and distribution for a long time. As you might imagine, the Verreaux's Eagle-owl is a skilled predator and, its large size and strong talons make it a force to be reckoned with. It is an opportunistic hunter - which means it will take down whatever it can catch and kill. Though perhaps its favorite, or most commonly taken prey item, is the hedgehog, its dinner options do not end there. It will prey on other mammals, such as mole-rats, ground squirrels, shrews, hares, bushbabies (a type of primate), vervet monkeys, baby warthogs, dik-diks, mongoose, weasels, genets, foxes, small wild felines, domestic cats, and bats. Wow, that is one long list of prey, but it doesn't end there. That was just a run down of some of the mammals Verreaux's Eagle-owl has been documented preying on - now, it is on to birds! While Verreaux's Eagle-owl often steals young from nests, it is not opposed to taking an adult bird if the opportunity presents itself. It will take relatively large birds, such as Great Egret, Purple Heron, and Black-headed Heron. While hunting near water, the herons and egrets aren't the only ones to fall prey to this large owl. It will also take ducks and coots. Other birds it will predate on include guineafowl, sandgrouse, hornbills, pigeons, doves, small bustards, crows, ravens and even nestling ostriches. But there are still more birds we need to add to the list. We have yet to talk about the fact that the Verreaux's Eagle-owl actually eats other owls, too, such as Barn Owl, Marsh Owl, and African Grass Owl. The Verreaux's Eagle-owl will also take diurnal birds of prey - that is birds of prey that are active in the day time. Some species that have fallen prey to this large owl are African Goshawk, African Harrier-hawk, Scissor-tailed Kite, and even Common Buzzard and Wahlberg's Eagle. This owl has also been documented preying upon Bateleur and Hooded Vulture nestlings. Right about now you might be wiping the sweat from your forehead and feeling grateful that we have finally made it to the end of the long list of items on a Verreaux's Eagle-owl's menu. But, don't be fooled. We aren't even close to being done! This owl also feeds on reptiles, amphibians and even large invertebrates. Venemous cobras, gentle house snakes, colorful frogs, large toads, slippery fish, scorpions, spiders and large dung beetles - which it snatches from elephant dung or bravely from beneath the hooves of grazing buffalo - are also happily consumed by the Verreaux's Eagle-owl. Though other, smaller invertebrates, such as termites and mites, have been found in their pellets, scientists believe these critters were accidentally ingested while the eagle-owl was eating larger prey. Gliding down from a perch is their preferred hunting strategy. Like most owl species, the Verreaux's Eagle Owl doesn't build its own nest. 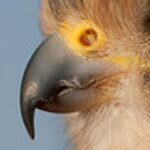 Instead, it uses nests built by other large birds such as vultures or hamerkops, eagles, and crows. Similar to the Ridgway's Hawk, which nests on top of a communal Palmchat nest, the Verraux's Eagle-owl sometimes nests on top of huge weaver nests. Weavers are small birds but build a large nest which many individuals use at the same time. It has also been known to use large hollows in trees as nesting sites on occassion. Just like the Javan Hawk-eagle, Verreaux's Eagle-owl is believed to be monogamous, meaning it stays with the same mate for life. Both the male and the female will work hard to defend their territory - often announcing their presence with calls and songs, warning other owls to stay away. These songs can actually carry (meaning they can be heard) up to 3 km away! When it is time to breed, the male and female will engage in courtship displays - this usually involves sitting together, preening each other, and making hooting calls while bowing to each other with the wings held partially open. When the female is ready, she will lay up around 2 eggs which are mostly all white. After the eggs are laid, there is a clear division of labor between the female and the male. The female will spend the next month or more incubating the eggs. This means she sits on them for most of the day in order to keep them protected and at the right temperature. Occasionally she will turn the eggs carefully to make sure they are kept warm evenly. While she is doing this, the male is responsible for capturing all the food for him and his female, and eventually his young, too. After the chicks hatch - usually about a week apart - the female continues to protect them and keep them warm. This is known as brooding. She does this for another 15-20 days, until the nestlings are able to control their own body temperature. Though often two chicks hatch, sadly, the second, younger chick has less of a chance to survive to fledging. This is probably due to the fact that the second chick to hatch does so about a week after the first - so its older sibling is already quite a bit bigger and can outcompete the younger bird for food. Over the next two months, the surviving young will continue to grow - and grow quickly. Once it reaches around 60 days of age, it is ready to leave the nest, though it might not be quite ready to fly at this time. Instead, it will walk out of the nest and begin to climb and explore its nest tree - sometimes hopping from branch to branch or flapping its wings to get some lift. It will usually make its first flight around 2 weeks after leaving the nest. While it is still in the nest, the owlet will also begin practicing another important skill for a Verreaux's Eagle-owl - singing and calling! 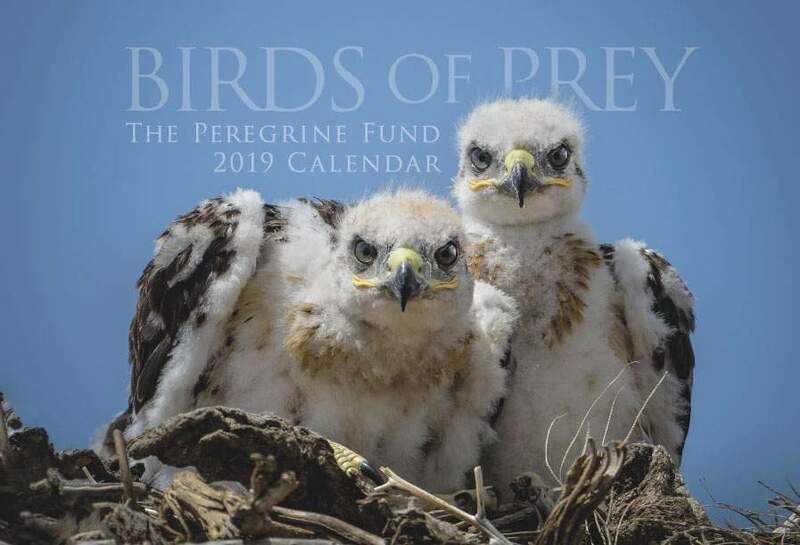 At The Peregrine Fund's World Center for Birds of Prey, the care-takers of a nestling-age Verreaux's Eagle-owl have reported that it trills a lot and is trying to hoot (which sounds almost like a hiccup and a cough)! After flying for the first time, young owl will spend several months exploring the area around the nest tree and will start practicing another very important skill - hunting. The young may remain in its parents' territory for up to two years. After that, it begins to search for its own territory. By the time the young reaches 3-4 years of age, it will be ready to find its own mate and produce its own young. Though no on really knows how old Verreaux's Eagle-owls can live in the wild, birds in captivity have lived up to 30 years. Come visit the World Center for Birds of Prey and meet our newest avian ambassador a young Verreaux's Eagle-owl that hatched on January 21 2018 at the Atlanta Zoo and was hand reared by their staff. It came to the World Center for Birds of Prey in March 2018 where it will make its permanent home. We also have other owls among our avian ambassadors, including a Eurasian Eagle Owl. This is a great chance to see owls up close and learn about the wonderful and interesting adaptations they have in order to survive in their respective habitats. There is also a touch table with owl feathers and other natural objects available for exploration.